Every consumer focused industry has a funnel or a process that maps consumer interactions and decisions prior to conversion. That might sound complicated. But, the funnel can be your guide to analyzing and conquering that ever present goal of getting more new patients. We will be diving deeper into the patient funnel below and to learn more, sign up for a free download of our simple, 7 Step Guide to Attracting More Patients Online.. Think about a typical retail sales funnel. The customer first hears about your brand, company, or product via marketing, referrals, or organic searching. The customer might visit your website to see product details or learn more about your company’s mission and policies. They also often visit third-party websites or information sources to solicit reviews and make comparisons. Commonly, the opinions and experiences of friends and family can heavily influence customer decisions. Now the customer can make a choice whether to buy your product—if they do, you have continued opportunities to build brand loyalty; if they don’t, they might knowingly (or unknowingly) re-enter your funnel in a different way at a later date. 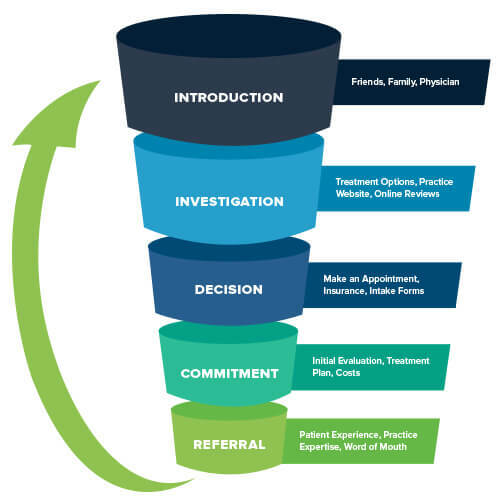 For physical therapy practices, the patient funnel has five key stages: Introduction, Investigation, Decision, Commitment, and Referral. 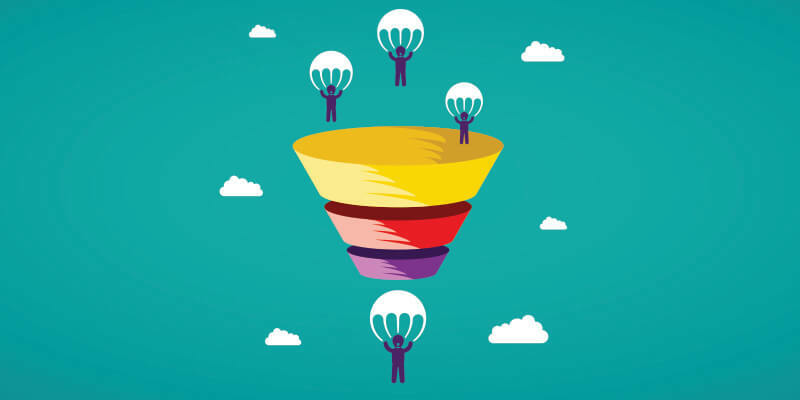 Let’s explore each to see how your marketing can optimize that stage of the funnel. Prospects (aka potential patients) find you via a friend, family member, doctor referral, social media share or online search engine. This introduction can be driven by a need “my back hurts and I need PT” or by a want “my back hurts and I want a way to feel better”. At this stage of the funnel, your practice’s marketing should be able to speak to both the need and the want. This is the researching phase of the funnel. The prospect will probably conduct auxiliary research. They have to think about whether PT and your clinic are the right choice over medicine, physicians, tests, or surgeries. Once the prospect has decided that PT is the right treatment for them. Then, they will most likely check out a number of local clinics—both yours and your competitors. One of the key elements in the investigation stage is visiting your website. We stress that website pages should explain the condition first; then demonstrate how PT can help the patient feel better. This strategy works! Those with a need can verify that PT is the right step for them, and those with a want can learn how PT can help them achieve their goal. Additionally, your brand has to speak to them and their emotions, getting them to decide that you and your clinic are the right choice. Patient testimonials, social media marketing, and online reviews can be very persuasive in this softer, more emotional research. Being able to relate to other patients, who have succeeded in their PT, helps drive the prospect into making a decision. The decision-making process flows from the investigation outputs. Both the informative and educational research about what is physical therapy and how it can help the prospect and the empathy research stemming from personal connections and emotions determine the next step. Once a prospect decides to make an appointment with your clinic for PT, your website can help affirm that decision. A Make Appointment form is critical to executing that decision—you need convert the prospect into a patient at the exact time that they make their own decision to come to your clinic. Converted prospects also want to be able to verify that their insurance is accepted and many prefer to complete referral and new patient forms in advance to save time at the clinic. The patient funnel does not stop at the decision stage. Now, you need the patient to commit to your treatment plan and refer their friends and family to your clinic. These last two phases will be covered in depth in our next blog post! To learn more about the patient funnel and how to best market your physical therapy practice, sign up for a free download of our 7 Secrets to Attracting New Patients through Online and Social Media.